If you are born on March 24, you are a visionary and you have a third eye for beauty more so than any other Arian does. You are also graceful, sensitive and independent. According to your birthdate personality, you are honest, sympathetic and modest people. You are also free spirited. Your compassion for others is commendable. If today is your birthday, people often remember you when they see you in social settings. You have a way about you that has an impact on others so they demand your company. You have a positive blend of quality traits that produce a harmonious Aries. March 24 Aries birthdays normally have an optimistic outlook on life. 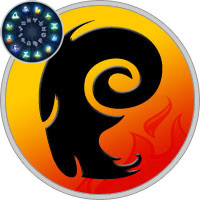 What could be viewed as a negative quality in Aries is that you work too hard. When your brain is in overload, you can act like an airhead or become indecisive. Otherwise, you are extremely perceptive and could possess physic abilities. March 24 birthdate meaning shows that you are a gentle and honest soul. You tend to encourage relationships with people whom you admire. Having like-minded associates helps you to remain vigilant and encouraged. With any relationship, Arians born on this day should learn something from it. People come to us for a reason… some relationships only last a season. With that being said, once you realize the reason, it is time to move forward. The March 24th birthdate horoscope predicts that Arians want love more than anything. In relationships, you tend to think with your heart rather than your mind. Therefore, you can be naive when it comes to love. You look for a partner that would give you a long-term relationship that is filled with chocolate roses and milk baths. It would not hurt if there were someone to taunt you with some pillow talk. While it is true you love receiving, giving is just as important. When you fall in love, you would do anything to please your soulmate. Everyone here on earth has a purpose. You believe that anything you do should be in support of that case. Whether the cause is for someone else or due to your own beliefs, you feel the labor should be enjoyable and fulfilling. According to the March 24 birthday astrology, handling financial matters is one thing that you do not find pleasurable and would do well to seek other professions that will benefit from your creative expression. In this case, Arians born on this day have no problems asking for help. What your birth date says about you is that you find it difficult to follow programs or itineraries. Arians love their freedom and one could say this confines any spontaneity. You like to go with the flow of things when it comes to planning your life. You say it does not matter how you get there, as long as you get there. Aries, do not overlook those small and seemingly inert details as they could prove to be important. You could slow down enough to stay focused or grounded, it would be to your benefit. The 24th March birthdate characteristics show that you are sometimes physically connected to emotional issues. It is not often but stress has its effects on you making you feel sad or unhappy period. Just assembling your daily routine could be stressful enough to cause you problems relating to your mental health. You do not drink enough of the right things to flush the toxins out of your body and this can cause you to feel sluggish. Arians should not drink a lot of caffeine based beverages or alcohol. Arians with zodiac birthday March 24 have an eye for beauty in people, places and things. You are a creative thinker that is susceptible to heartbreak or to breaking hearts. You have some difficulties following rules and directions. Those born on March 24 believe that everything and every person have a reason for being and we should serve this purpose to the best of our ability. You will need a clear mind so stay clear of things that will impair your judgment. The gentle nature of March 24 people encourages relationships with those who are emotionally stronger. They often establish friendships with people who may serve as mentors or advisers. Love may be complicated because they need to learn from each romantic encounter, hence the tendency to lose interest in a partner once the "lesson" has been learned. Because of their kind and docile personality, March 24 individuals are likely to be the one to whom other siblings come to share a confidence. They are tender, indulgent parents. Because they have difficulty enforcing rules and discipline, they may not be particularly successful in this role. What they do best is set an exemplary pattern of behavior for their youngsters. Any creative outlet makes a worthwhile career for those born on this date. They have a natural flair for color and make excellent decorators, designers, or artists. Handling money is not their forte, but they can benefit from professional attention. Natural enthusiasm helps keep March 24 natives feeling emotionally energized. They are not especially active individuals and prefer to get their exercise from normal daily activity rather than a workout regimen. They should drink plenty of water and stay away from caffeine. For most March 24 natives, the concept of personal and professional goals may be an abstraction. They have a general idea of what they want to happen in their lives, but it is likely to be tempered by their wonder and enjoyment at watching events unfold. March 24 Zodiac belongs to the first decan of ARIES (March 21-March 30). This decan is under the supervision of the planet Mars. Those born in this period are passionate leaders just like a true Aries and fiery idealists just as Mars makes them be. This period is also said to magnify all the positive and negative characteristics of Aries zodiac sign. Being born on the 24th day of the month shows exuberance, imagination and charm but also great attention and responsibility. The numerology for March 24 is 6. This number reveals responsibility, affection and a domestic approach to life. Those Aries associated with the number 6 enjoy spending time with families and building a safe environment for those they love. March is the third of the year, bringing the enthusiasm and revival of spring. Those born in March are attractive, loving and fine observers. March 24 Zodiac people are determined and generous. March symbols that resonate with these people are Aquamarine and Emerald as gemstones, Daffodil and Shamrock as plants and Mars, the god of war. The ever-lasting pressure born March 24 transfer all bad. This inhibits their vigor and activity and gives them a very painful experience. These people can be gentle and frivolous as children, they are always true to his feelings and affections, but despite all this, they often find themselves in all sorts of alterations. This is due to the fact that born March 24 childishly naive and sometimes just do not know how to protect themselves from low-lying side of life on earth. They are optimistic about the surroundings and may not notice ripening threat. They need to learn to be more careful and attentive, somehow limit their straightness, to develop a systematic approach to problem solving. Children’s openness and spontaneity - very good quality, but make sure that it does not complicate your life.